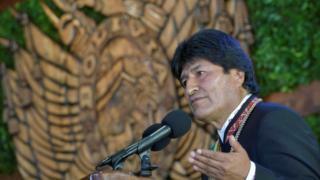 Bolivian President Evo Morales has said that Chile made a secret offer in 1975 to grant his country access to the Pacific Ocean through a 10km corridor. In exchange, he said Chile asked for a land swap and fresh water. Mr Morales said the Chilean offer was revealed in files recently declassified by President Trump in the US. Bolivia lost access to the sea at the end of the 19th Century, after being defeated by Chile in the War of the Pacific. After the 1879-83 war, Chile annexed 120,000 sq km of Bolivian land, an area roughly the size of Greece. Bolivia lost 400km of coastline as a result and has been landlocked ever since. It has never given up its fight to regain some of the areas lost in the Atacama desert. However, Chile's 1975 offer was never acted upon. The reasons for this are not clear. Four years ago, it took the case to the International Court of Justice (ICJ) in the Hague, which is yet to issue a ruling on the border dispute. Chile has not yet reacted to Mr Morales' comments. But it says Bolivia agreed to their present borders in a treaty they signed in 1904. President Morales said that in mid 1970s the military leaders who ruled Chile and Bolivia at the time - Augusto Pinochet and Hugo Banzer - briefly restored diplomatic relations and worked on a deal. "Chile was looking to establish an alliance against Peru," wrote Mr Morales on Twitter. Peru also has strained relations with Chile. It fought alongside Bolivia in the War of the Pacific and also lost territory to Chile in the conflict. The negotiations failed, Mr Morales added, after Peru suggested the construction of a port in the area to be jointly managed by Chile and Bolivia. The Chilean government rejected the proposal, he said. "Chile says it has no outstanding problems with Bolivia, but history shows that it admitted having an obligation to accept Bolivia's demand for sea access," wrote Mr Morales.